Ven. 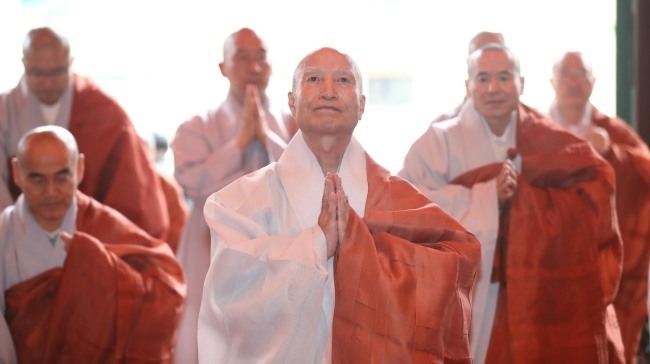 Seoljeong was elected the new leader of the Jogye Order, South Korea's largest Buddhist group, on Thursday. The Jogye Order announced that Ven. Seoljeong won 234 votes from 319 electoral college members representing more than 14,000 Buddhist monks, overwhelming his sole rival, Ven. Subul, who received 82 votes. Ven. Seoljeong will begin his four-year term as the 35th chief of the order on Oct. 31 after receiving approval from the order's elders' committee. The victory by the 75-year-old monk came despite allegations raised by a Buddhist media outlet that he has secretly fathered a child in the past. "I will clearly speak on the allegations by all means. It is because I believe I cannot carry out my duty for the order without doing so," Ven. Seoljeong said at a press conference after receiving an election certification by the order's voting committee.